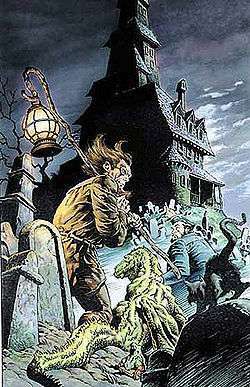 Cain, Gregory, and Abel approach the House of Mystery (the House of Secrets looming in the background) in Berni Wrightson's cover artwork to Welcome Back to the House of Mystery #1. Originally, Cain and Abel were the respective "hosts" of the EC-style horror comic anthologies House of Mystery and House of Secrets, which ran from the 1950s through the early 1980s. During the 1970s, they also co-hosted (along with Eve) the horror/humor anthology Plop!. Both comics had been running reprints of Dial H for Hero and Eclipso, respectively, before the introduction of the new host characters. Abel, created by Mark Hanerfeld, Bill Draut and Joe Orlando, first appeared in DC Special #4 (July–September 1969), and began hosting The House of Secrets with #81 (August–September 1969). Hanerfeld was the model for Abel, and he also appeared in a photograph in Elvira's House of Mystery #4. In turn, in the graphic novel The Sandman: The Wake, Cain is so distraught when Abel is murdered permanently by The Kindly Ones, he sinks into a rambling mess when asking the new Dream to restore him. In preparation for the funeral services for the deceased Dream, Cain's anger boils over yet again, but he is calmed by a reprimand and restrains from murdering Abel. He displays a contract, renewed in 1989 (the year The Sandman began) that states that only he is allowed to kill Abel, because Abel can resurrect only when Cain kills him.